My college major was biology. I loved the subject, especially microscopic anatomy and histology. I suppose my dream career was to be a forest ranger or maybe just teach biology. Many of my college buddies were pre-med. I felt a distance from them. They seemed so self assured about their futures while I was still waffling. Hey, I thought, those guys are no smarter than I am. Why not at least give medicine a try? Pathology appealed to me, and it was very close to my college interests. Still not sure, I added classes to qualify as a pre-med “just in case.” Actually, all I needed was a physics course as I was otherwise loaded up with science credits. I took a summer evening course at Fairleigh Dickinson University in Rutherford. (We then called it “Fairly Ridiculous U”). 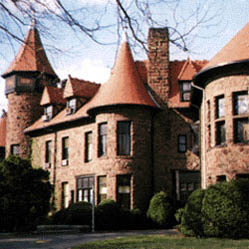 The picture shows the remarkable Eviswald Castle, on the Rutherford FDU campus (now Felician University). It was on the park-like estate that was to become the FDU campus where, as a kid in the early 1940s, I discovered all the robins that had been poisoned by DDT. That physics course was one of the best classes I ever took, thanks to the talented professor, whose name now escapes me. Class started around 6:30 or 7:00 PM and went until about 10:00 PM. I needed to make money, so I applied for a job at Sam Hird Woolen Mill in Paterson (or was it in Garfield?). This job was the pits, non-union, but it paid about $3.75 an hour, for an eight hour “graveyard” shift that fit my school schedule (actually 10:45 PM to 7:15 AM because there was an unpaid half hour off for lunch– according to this inflation calculator, the $3.75 I was making in 1956 was worth $28.31 in today’s dollars). My job was “spinner.” That meant I had to turn huge rolls of rough yarn that looked like shaggy knitting material into fine thread. To do this, I ran a long bank of spinning machines. The yarn spools were arrayed on many levels up at the top and the finished thread was collected on a row of long wooden spools down below (the picture below shows cotton being spun into thread on a similar machine). A bright light illuminated the long line of threads that were rapidly being spun. If one thread broke it immediately caused a noticeable gap in the orderly array, and my job was to quickly restore continuity of the broken thread by joining the lower end with the yarn above, and working them into the spinner together. Whoever designed the machine was a genius, as it virtually assured that at any moment in time there would always be at least one or two broken threads out of the hundred or so concurrently spinning. If a worker took a ten minute break and another employee had to cover the second machine, this doubled the effort on the part of both to reduce the number of broken threads to the manageable two or three. The half hour lunch breaks had to be staggered as well, and cross-coverage created an even greater backlog. The machines could not be shut down, as this would break almost all the threads. The foreman sometimes pitched in as an operator and there were also one or two floating workers to help with breaks and absences. The air in the factory was milky white with tiny wool fibers. When we coughed or blew our noses we produced little fur balls. There was no lunch room. We sat on the fire escape landing to eat or smoke in fresh air, unless it was raining, in which case a small table next to the machines was our “lunch room.” This upset the employees, most of whom were Italian and Polish immigrants. They were also galled because the corporate offices downstairs had a Coke machine and an air conditioned lunch room, all off limits to us peons. I heard about and shared their gripes, but was glad to be making so much money. Then I was unexpectedly drawn into labor negotiations. At about 2:00 AM one morning, the Italian guy who worked the spinners next to mine said “Enough! We shut off machines.” He meant business. The foreman almost cried. I noticed that he acted as if intimidated by the Italian. One by one the machines wound down, and we just sat in silence on the floor. It was a true “sit-down strike.” It took about an hour for the owner, a descendant of the founder, Mr. Sam Hird, to appear, wearing a suit and nice white shirt and tie. He asked us what the problem seemed to be. Everyone sat there, intimidated or linguistically impaired. Out of the blue, my Italian friend said to me, “OK kid, you tell him!” So suddenly I was spokesman for a very downtrodden group of hourly workers. As politely as I could, I outlined our grievances. Mr. Hird looked at me quizzically (like “What the hell are you doing here?”) and said he would take our complaints under consideration and get back to us. One by one, the machines were turned on with extra help for each startup, and by quitting time things were almost back to normal. Many of us habitually stopped for a beer with several co-workers before work, in a tavern that was directly across the street from the mill. We also regularly came into work a few minutes late, because the extra half hour caused a 15 minute overlap between the ends of each shift and it was not necessary for two employees to run the machines for that amount of time. We just said hello and goodbye and picked up the other spinner’s job right where he left off, a little before 11:00 PM and again a little after 7:00 AM. This let both of us off a bit short of scheduled time at each end of our shifts. It was an established practice and no supervisor ever told us anything different. Since half the summer was gone, I applied for unemployment. After a delay of a couple of weeks I was notified that I was ineligible for unemployment because I had “engaged in illegal labor action, to wit, employee misconduct: organizing and participating in a wildcat strike.” That was really a bummer. Thank God I could fall back on the A&P job.